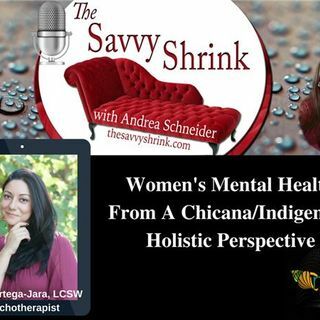 Listen in as The Savvy Shrink interviews Emilia Ortega-Jara, LCSW, owner of Corazon Counseling Services in Riverside, CA. We are fortunate to hear Emilia's wisdom as a licensed clinical social worker with a practice specialty of women's mental health from a Chicana/indigenous holistic perspective. We will learn how she approaches the clients she serves and how best to honor and bear witness to the challenges Chicano/Latino clients face in this heated political time. Emilia's ... See More therapeutic work incorporates various traditional indigenous wisdom, and eastern wellness teachings along with evidence based psychotherapy techniques such as CBT and DBT. In addition, she brings a social justice framework into my healing practice addressing the historical trauma many have experienced due to the social, cultural, and political inequalities that to this day continue to negatively affect the mental and emotional wellness of families. Emilia has extensive training in perinatal mood/anxiety disorders, EMDR, and has a bilingual Spanish speaking practice.